While these comments highlighted the need for a broader discussion about court reform, the conversation they generated has lacked important context: Court packing is not a theoretical possibility, but rather an ongoing effort by conservatives happening right now. 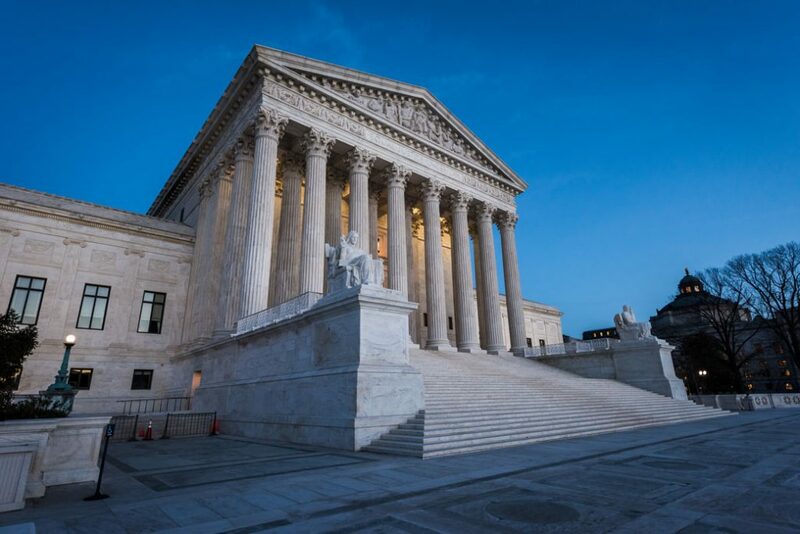 The phrase court packing hearkens back to President Franklin Roosevelt’s efforts to alter the makeup of the Supreme Court in the face of the court’s repeated decisions striking down his New Deal legislation. Roosevelt’s plan, which would have added up to six justices to the court, engendered significant opposition and was never enacted. The last four years have seen conservatives—under the leadership of Senate Majority Leader Mitch McConnell (R-KY) and aided by organizations such as the Federalist Society and Judicial Crisis Network—embark on a similarly audacious plan to achieve their policy goals by altering the ideological bent of the courts, including the Supreme Court. Their plan, however, is subtler: Instead of adding justices in one fell swoop, they have been packing the federal courts through abuse of the Senate’s advice and consent power. Conservatives’ stealth court-packing plan is a two-step approach. Step one: Steal seats by blocking the confirmation of judges until both the White House and the Senate are under conservative control. The most infamous example was the McConnell-led refusal to even hold a hearing for President Barack Obama’s nominee for the Supreme Court, Merrick Garland. But the treatment of Judge Garland was merely the most visible manifestation of a far-reaching scheme to hold judicial seats open until a conservative president could fill them. It was conservative efforts to prevent any appointments to the U.S. Court of Appeals for the District of Columbia Circuit—following five years of obstructing Obama’s judicial nominees—that finally led senators supportive of President Barack Obama’s nominees to eliminate the filibuster in 2013 when confirming lower-court judges. Step two: After first preventing President Obama from appointing judges, change the nomination and confirmation process rules so that the most partisan conservative judges can be appointed at breakneck speed. First, conservative Senate leaders invoked the so-called nuclear option to allow Supreme Court justices to be confirmed through majority votes. Then they cut home-state senators out of the judicial nominations process, ending a century-old tradition of giving those senators a say in the judges that were confirmed. To further speed the process, they stopped working with the American Bar Association (ABA) to determine whether nominees were qualified to be judges, resulting in Trump nominating six nominees that the ABA deemed “not qualified.” In addition, they broke the Senate committee review process by packing hearings and markups with too many nominees to properly vet, including doing so twice when the Senate was actually in recess. For the confirmation of Supreme Court Justice Brett Kavanaugh, they refused to request all his records and refused to allow sufficient time to conduct a real investigation of credible allegations of sexual assault made against him. Other nominees have been pushed through the process despite serious issues being raised, including nominees with ties to a designated anti-LGBT hate group and writings that spread conspiracy theories. A now-confirmed nominee had even attempted to dismantle protections for people with pre-existing health conditions. The result: In a little more than two years, Trump has already appointed more than 90 judges to the bench—more than one-tenth of the entire federal judiciary and 20 percent of the appellate courts. Now, Senate Majority Leader Mitch McConnell is trying to accelerate the court packing process. He is moving forward with a “new nuclear option to speed Trump judges” that would reduce debate time on federal district court judges from 30 hours down to just two. 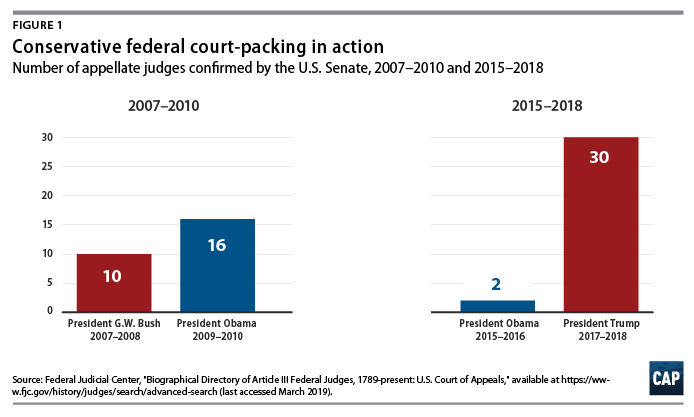 With this latest change, even assuming that not a single additional judge steps down in the next two years, Trump could pack the court with more than 255 judges by the end of his first term, nearly one-third of the entire judiciary. Regardless of one’s views on the merits of some of these procedural changes—such as shortening the length of debate or eliminating home-state senator input—conservative efforts to use those rules to stall or block nominations by President Obama and then abandon them for their own nominees makes clear this is about court packing and nothing more. If allowed to stand, conservative court packing will have real consequences for a generation or more. Conservative judicial ideologues can limit rigorous campaign finance reform; place a judicial stamp of approval on anti-democratic gerrymandering and voter suppression; undermine unions; and gut reproductive rights. They can also undermine future efforts at progressive reform through specious legal claims—and once the Supreme Court has ruled something unconstitutional, it can shut down policymaking in that space completely. This is not just conjecture. The Roberts Supreme Court has repeatedly sided with big corporate and special interests that are aligned with the conservative movement. And that was before Justice Anthony Kennedy was replaced with the far more conservative Justice Kavanaugh. The first step to combatting conservative court packing is being clear about its existence. Without that, we cannot understand the depth and breadth of the problem that we need to address. Any conversation about the courts must start from the same basic starting point: Conservative ideologues are already engaged in a massive court-packing effort in order to establish control over the judiciary for a generation—and progressives need to start talking about how to respond. Sam Berger is the vice president for Democracy and Government Reform at the Center for American Progress.